This is just a small update to fix a few things I didn’t like or add minor things I didn’t have enough time to make for earlier updates. All these things have been added to the GFX Generators so you can make your own fake screenshots and other graphics with them. Plans for 2016? I’m working on the overhaul for the GFX Generators (got sprite placement working a few days ago, will be back at it this weekend) and hope to get those done for spring 2016. The small videos on the YouTube channel were just practice and 2016 will be showtime. There WILL be more pixel art prints for me to peddle. Still replacing edits with fresh scratch-made sprites. 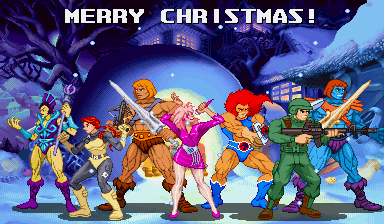 Be sure to check out the 2015 wrap-up site posts from Shinju Forest and VGJunk! Take care, have a Happy New Year and thanks again for checking out the site! 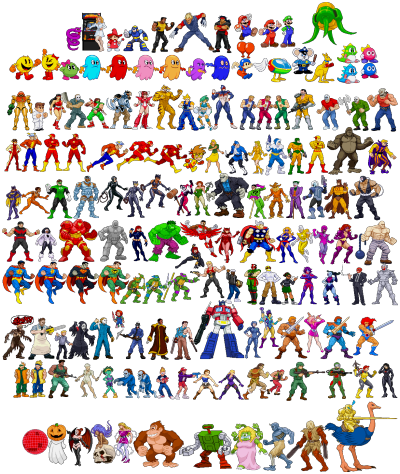 Seeing as how it’s Christmas Eve, I thought it’d be a great time for an update with toy sprites! 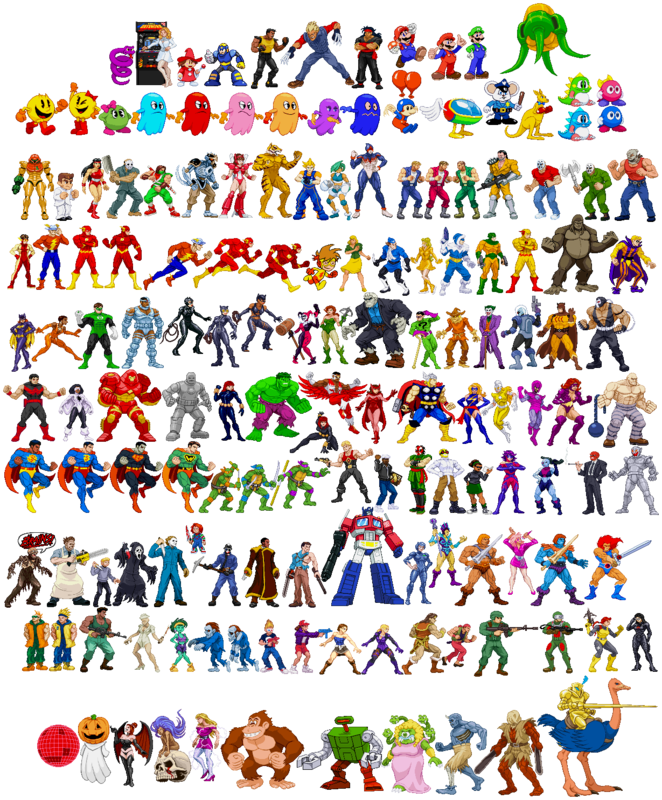 New sprites of Evil-Lyn, Scarlett, He-Man, Jem, Lion-O, Grunt, and Faker have been added to the Toys and Cartoon and G.I.JOE galleries, along with the GFX Generators (where you’ll see even more palettes for Scarlett and Grunt). 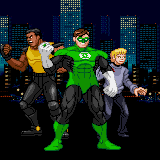 I also fixed the sprite of G.I.JOE’s “Flash” Gambello, because he was far too short. the Night City Assault beat ’em up Kickstarter only has a few days and is halfway to its goal, so check out the campaign, try out the playable demo and help it out if you can! Disappointed in the lack of cybernetics I saw on Cyber Monday, I’ve decided to try and make up for that by celebrating cyber-related characters and games for the entire week. Check back with this post for updates every day! 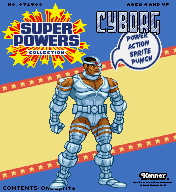 Cyborg, in classic flavor, is now in the DC Comics gallery and GFX Generators (where he has extra palettes)! A new sprite of Kamaitachi from Ninja Warriors Again (from the beautifully developed SNES/SFAM game by Natsume) has been added to the Taito gallery and GFX Generators (where the Mego WGS style in the GroupShot generator finally has a Taito character bubble set)! Kunoichi (my old version of her need to be redone) and Ninja won’t show up in this theme, but they’re on my to-sprite list. 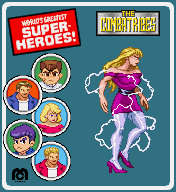 Welcome your new cyborg gang overlord, Martha from Technos’ beat ’em up, Combatribes. She’s been added to the Technos gallery and GFX Generators along with two versions of the Combatribes logo has been added to the mini-logo page. 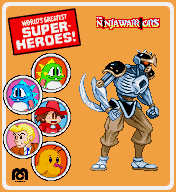 Partly pixels, partly real, a new sprite of Steelheart, from the SilverHawks cartoon and toyline, has been added to the Toys and Cartoons gallery and the GFX Generators! 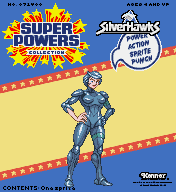 The SilverHawks logo has been added to the Toys and Cartoons mini-logo gallery. Reminder: the prints in the shop are on sale until this Sunday, November 6th. 8×10 and 8×11 prints are $4.50 each while the 11 x 17 prints $8.50 each. There’s a wider variety of prints on the Illmosis site print page, so check that out, too!